Unknown Italian Army Unit Circa Early 1940s. Click on picture for larger image. 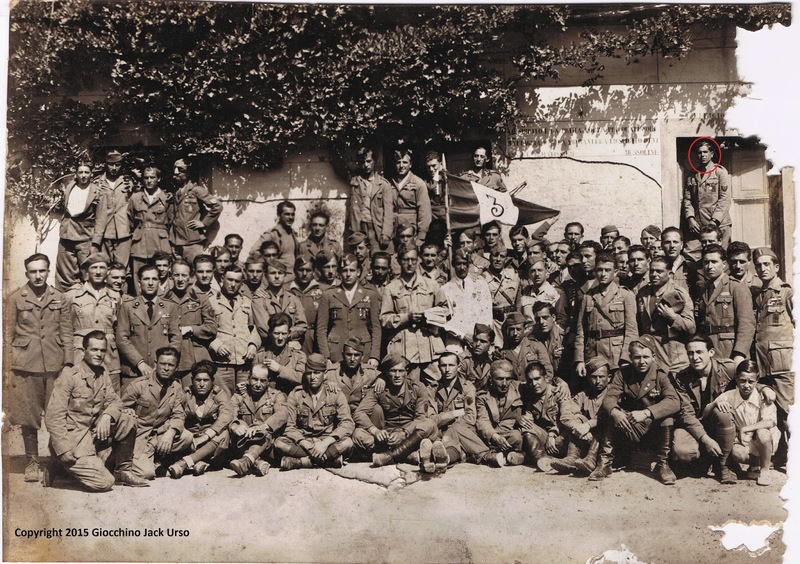 In the upper right-hand corner of the photo above, standing alone and circled in red, is my grandfather Sebastiano Mario Sartorio who served in the Italian Army during the Spanish Civil War and in North Africa, where he was captured by the allies in late 1942 or early 1943 and sat out the rest of the war in a P.O.W. camp. This photo was found between the joists in a basement crawl space of a house my grandfather built in Whitehall, NY, where he moved his family, including my mother Maria Sartorio whose wartime experiences in Sicily are recounted in the audio documentary News from the Front: Memories of a World War II Refugee. Following the internment of my mother’s ashes on May 23, 2015, we visited the current owner of the home who — very much to our surprise — presented us with the photo you see above. I wonder, how much my mother could have told us about this picture had she known it existed? The moment underscored for me, as a student of history, how tenuous are the ties that bind us to the past and how quickly information is lost — often within the span of a generation or two. UPDATE 28 May 2015: The editors at Military History have identified my grandfather’s unit as the 133rd Armored Division Littorio, which was wiped out following the Second Battle of El Alamein in November 1942. This means my grandfather served right up to the very end. Many thanks to managing editor David Lauterborn! When I was a young boy in the 1970s, a young female doctor lived in the apartment over my grandparents. She was beautiful, smart, and she was Iranian. Just before the 1979 revolution, she returned home. My grandmother received several letters from her telling us of her life back in Iran — but then the letters stopped and we never heard from her again. I relate this story because in our frustration and warmongering with Iran we forget the Iranian people. They are not faceless Islamic Extremists, yet because we have not had normal diplomatic relations, trade, or travel we objectify them, and it is easier to go to war with a faceless enemy than say, the neighbor upstairs. On June 7, 1981, Israel carried out Operation Opera — the surprise air strike that destroyed an Iraqi nuclear reactor under construction about 10 1/2 miles southeast of Baghdad. There is considerable congressional GOP opposition to any deal with Iran, and the subtext of the conservative response is a gearing up for a recreation of Operation Opera. While it is true that any deal between the United States and Iran would be non-binding, the unstated assumptions from the moderate-liberal side of this discussion is that any such deal simply buys the West time: Time to build up political support and/or wait for a regime change. There is no doubt that Iran is a politically destabilizing force in the region. Its support of terrorist activities and confrontations with U.S. forces are too numerous to recount here. For various reasons, a second Operation Opera will result in unifying Arabic military action against Israel — and the West — and due to an increase in local military weapon systems and training a successful second Operation Opera may not be so easily achieved. Also, we must consider Saudi Arabia is now saying it will pursue the bomb itself if Iran gets it. Pakistan has the bomb now, and that government could give way to extremist elements if Israel does bomb Iran. India, of course, has the bomb, as does Israel, and the domino effect could swiftly get out of control. Right now, any idea of a military action like Operation Opera to resolve the Iranian threat is foolishly irresponsible. That time may come. Some nations, like Saudi Arabia, are certainly more cautious regarding any expansion of Iranian power, but we’re not there yet politically and the rush for a military solution is being offered up by the same people who led us into the poorly thought-out invasion of Iraq, which has resulted in virtually no strategic benefit to the American position in the Middle East. Indeed, the region would be more stable had we never invaded. If Iran were to develop an atomic weapon the fear that they would use it against Israel — home to the Dome of the Rock, one of Islam’s most-holiest shrines — is so detached from reality it only proves to show how ignorant many in the West are of Islam. Less likely is that they would share the technology with a group like ISIS, who would as likely turn the weapon against Iran as they would any of their enemies. It’s true, Iran refuses to acknowledge Israel’s right to exist, however, the ayatollahs probably don’t think America has the right to exist either — and the same could probably be said about some hard-core Soviet Communists during the Cold War — but that shouldn’t stop us from negotiating with Iran any more than it stopped us from negotiating with the Soviet Union. No, I’m not in favor of Iran having a nuclear weapon, but, frankly, I don’t think any nation, including the United States, should have nuclear weapons, but as the saying goes, the genie is out of the bottle. Pakistan has nuclear weapons. India has nuclear weapons. Israel has nuclear weapons. North Korea has nuclear weapons, and one day Iran will have nuclear weapons. If North Korea, despite being the pariah of the world, could develop a nuclear weapon, do we really think that Iran won’t do so as well? No matter if the negotiations are successful and Iran allows monitoring, the fact that Iran will one day have nuclear weapons is an inevitability and anyone who tells you any differently is trying to sell you a bill of goods. What these negotiations are really about is buying time and establishing a framework for the resumption of normal diplomatic relations and trade. These are the ties that prevent war – not saber-rattling and threats of war. Whenever the debate about Iran hits the news, yes I think about war, atomic weapons, and terrorism — but I also remember that smart, beautiful Iranian doctor who lived above my grandparents' apartment. That Iran still exists. We should remember that while our politicians rush to lead us into another war to prove a political point and curry favor with their rich donors, few of whom will be sending their own children to fight the next war.